To add the date and time to your document, you can insert them from the Insert menu. 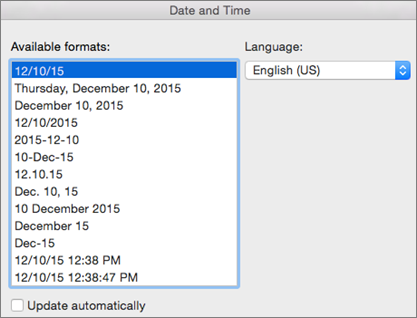 You can also have Word automatically insert today's date by typing the first few characters of the date. Click in your document where you want the date and time to appear. On the Insert menu (not the Insert tab), click Date & Time. Click the date and time in the format that you want. To have Word automatically update the date and time when you open or print the document, select the Update automatically check box. In your document, type the first four characters of the current date. For example, if today's date is January 1, type Janu for January. Word displays the current month in a ScreenTip. (This works only for months that are six letters and longer. See the note below for additional information on months whose names are less than six letters). Press RETURN to insert the month, and then type a space. Word displays the current date in a ScreenTip — for example, January 1, 2017. Press RETURN to insert the date. Note: To automatically insert today's date for a month whose name is less than six letters long, for example, May or June, type the entire month name followed by a space, and then press RETURN.